I almost screwed these up because of an insane pistachio addiction. I could be featured on Intervention. It’s that bad. I bought a big old bag of pistachios and knew I had to keep enough to make these Chocolate Pistachio Cookies, but I was eating probably two for each one that I put in the bowl for the recipe. I ended up uncomfortable and almost unable to make the freakin’ recipe. 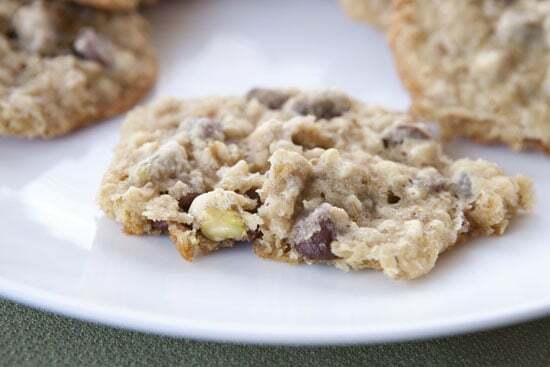 Assuming you can restrain yourself from eating all the pistachios though, these are pretty simple to make and a nice change on your standard chocolate chip recipe. 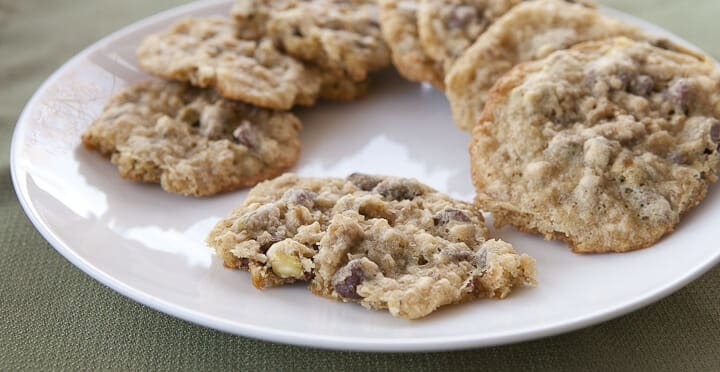 These delicious chocolate chip cookies jam-packed full of pistachios. They’re easy to make and great for a holiday dessert. 1) Preheat oven to 350 degrees Fahrenheit. In a medium bowl, stir together flour, baking soda, and salt. 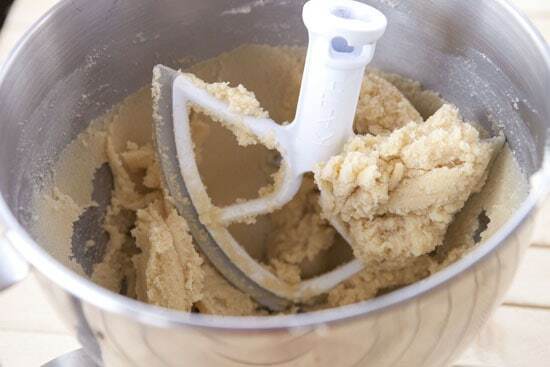 2) In the bowl for a stand mixer (or using a hand mixer) beat together butter and sugars until it’s light and fluffy on medium speed, about 3-4 minutes. 3) Add in eggs one at a time and stir. Then add in orange liquor. 4) Add in dry ingredients and stir until just combined. Then stir in oats, chocolate, and peeled pistachios. 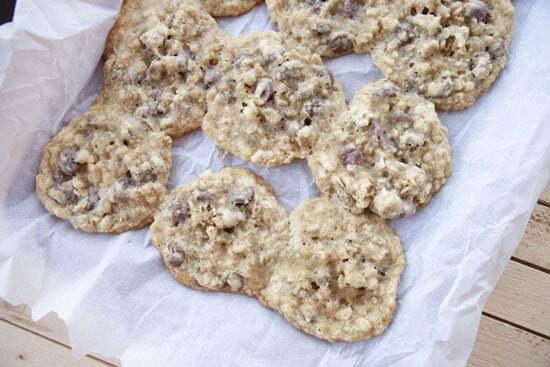 5) Spoon cookie dough onto baking sheets (I like to line mine with parchment paper). The cookies should be heaping tablespoons. You should be able to get 12 on a normal baking sheet, but be sure to leave about 2 inches between cookies. 6) Bake cookies for 8-10 minutes at 350 degrees Fahrenheit until they are lightly browned around the edges. 7) Remove cookies and let cool for at least 10 minutes before eating. It turns out that you can buy pistachios that are pre-shelled but that kind of takes the fun out of it. Also, shelling them means that I can only eat them as fast as I can shell them which saves me from gorging. I used about 2/3 of a cup of pistachios but you could use up to a cup. Don’t even worry about chopping them. I like them whole in the cookies. This is a pretty standard cookie dough recipe with some orange liquor tossed in. The orange flavor replaces what would normally be vanilla and goes really well with pistachios. To make the dough, beat together the butter and sugars until they are nice and creamy using either a stand mixer or hand mixer. Then add in the eggs and orange liquor. Once that base is made, add in your dry ingredients (flour, baking soda, and salt mixed separately). Then fold in the rolled oats and all of the lovely add-ins. 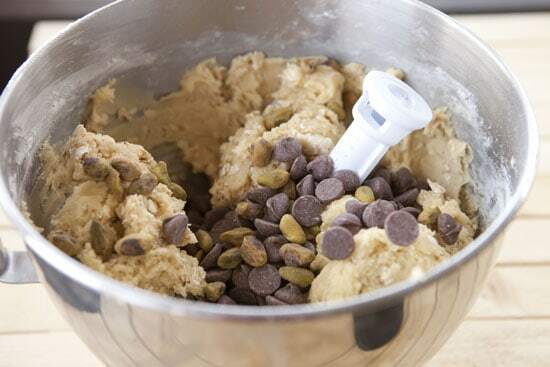 Try not to over mix the dough at this point or your cookies will get tough. Just mix it until everything is combined on low speed. You can also fold in the add-ins with a big spatula which is the best way to do it to ensure that you don’t overmix the dough. Scoop out the dough on a few baking sheets lined with parchment paper. I would recommend a heaping tablespoon for each cookie although I made mine a bit larger. Leave a few inches in between cookies as they will expand as they cook. You should get around 36 cookies out of the batch. Bake the cookies for about 8-10 minutes at 350 degrees until the edges of the cookies are lightly browned. Don’t over cook these guys! It’s okay if your cookies flow together slightly like mine did. You can just chop them apart when the cookies cool. Let the cookies cool for a few minutes before eating them. As you can see, each cookie should have plenty of chocolate and pistachio bits. If you’re having a holiday party or just family over for the holidays, have a plate of these Chocolate Pistachio Cookies out and they will be gone before you know it. 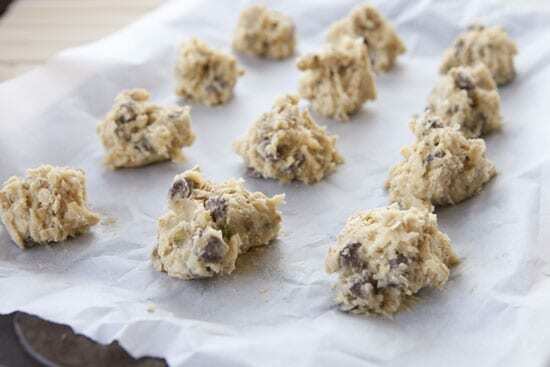 If you don’t want to bake all of them at once, you could roll the dough in parchment paper and freeze it and then just cut off dough as you needed it and bake them fresh. Hah not to fuel your addiction, but have you tried salt and pepper pistachios? Yeah. HUGE problem. i’m kind of disturbed by the idea of baking with pistachios because it’s never occurred to me before now…but these cookies look oddly delicious. I’m a long-time CO baker and wanted to make one comment/suggestion. It looks like those cookies could use a little more flour, perhaps. I’ve almost always had to adjust recipes for cookie dough for this high altitude, and that usually means more flour than you think. When my cookies come out a little flat (although still totally tasty), I add in a bit more flour for the next batch and they puff up a bit more. My first batch is pretty much always the test batch for the flour content. I’ve never made pistachio cookies and now I’m totally going to. Thanks for the idea! Awesome tip Sarah! THanks for the comment. They were a bit on the thin side now that I think about it. 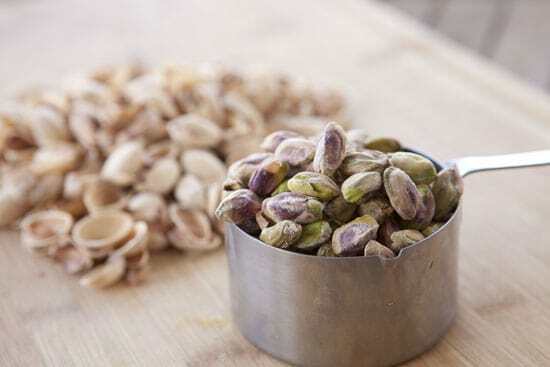 Are you using salted or unsalted pistachios?? I can’t wait to try them!